This pattern calls for three colors but you can change the number of colors or the order of the color changes to make your own unique creation! Not sure how to change colors? 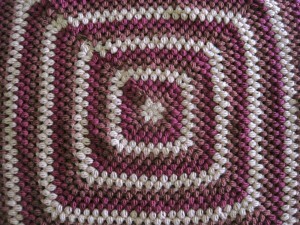 See How to Change Colors in Crochet for help! Rows 5-14: continue on with Round 4 by putting two cls in each corners and one cl in each ch-1 space along each side, changing colors every two rows. Round 18-30: continue on with Round 17 by putting two cl in each corner and one cl in each ch-1 space along each side, changing colors every two rows. 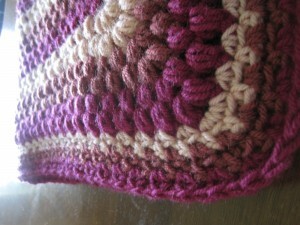 This entry was posted on Tuesday, August 10th, 2010 at 1:04 AM by Erin Burger	and is filed under Free Crochet Patterns. You can follow any responses to this entry through the RSS 2.0 feed. You can leave a response, or trackback from your own site. I still use this blanket at my gramma’s house! =) Thanks so much for the pattern, I’ll be linking to this. Thanks for the pattern. That is awsome. We used to call this a popcorn stitch and we made rugs out of all the scrap skiens leftover. Popcorns and Clusters are made completely different Debra.. Thanks for sharing the pattern with us Rachel. Blessings! Could you make this without changing colors? Sure! Follow the pattern, but ignore the instructions that tell you to change colors if you just want to use one color. I started this a while back, and when I got it out to work on it, now I know why I put it away. It bulges in all the wrong places. I’ve put too much work into to discard it. Why did it do that? my stitches too tight? Thinking maybe I’ll crochet a sc back and make it into a throw pillow! Any thoughts from anybody….anyone with a similar problem? Is there a trick to making a giant granny square and have it come out straight instead of crooked?